You’re flying… kind of! Cape lets registered users fly drones in remote locations. 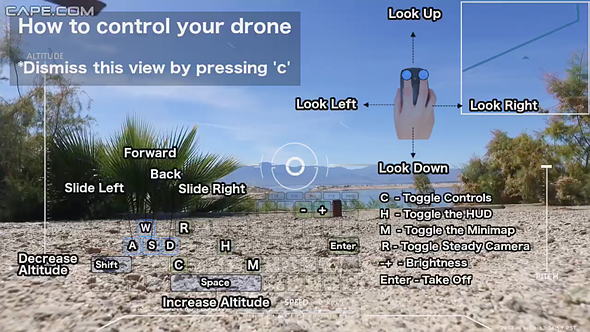 Takeoff and landing are handled automatically by the drone. We were promised jetpacks, but as many-a-scholar has noted, here we are knocking on 2020’s door and we are still jetpackless. We have, however, managed to put countless drones into the sky. While jetpacks are scarce, a drone can be had for as little as $15 and as much as, well a hell of a lot more than that. Anyone can fly a cheapo drone into their living room wall, but if you want to fly a bigger drone somewhere cool there are costs, logistics and federal guidelines to contend with. What’s an apartment-dweller with big drone flying ambitions to do? 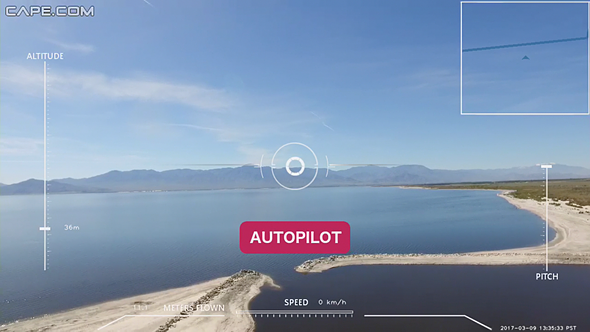 Enter Cape: a service that lets you fly real drones in real outdoor locations, without leaving the comfort of your home or your web browser. No license, no learning curve, no expensive crashes. Flight locations are exclusively located in California at this point, and the service is in beta so its developers expect to work out some bugs and improve latency before launch. Deep into a stretch of grey Seattle weather, flying a drone around a sunny California desert sounded fantastic to me. Just sitting at my desk in Seattle, flying over the Sacramento River. You know, no big deal. Cape’s locations include desert and coastal sites including San Francisco Bay, the Salton Sea and Sacramento River. Each has its own hours and days of availability, but most are available weekdays until 5pm Pacific Time. 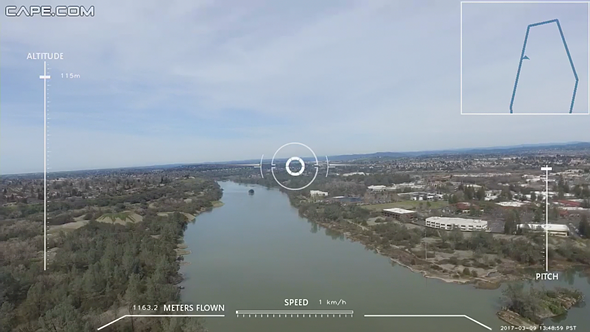 Provided your internet connection is robust, all you need to do is select a site that’s available and hop to the controls of your very own DJI Inspire 1. Your flight begins with a diagram of your keyboard control shortcuts overlaying the camera’s live feed. Getting started just requires pressing ‘enter’ to initiate autopilot take-off. And there you are – soaring above the California desert with the press of a button. When your session starts, you’re met with this handy controls diagram. Cape’s drones are as dummy-proof as you’d hope they would be. A map in the corner of the screen indicates where your aircraft is in the geo-fenced zone. 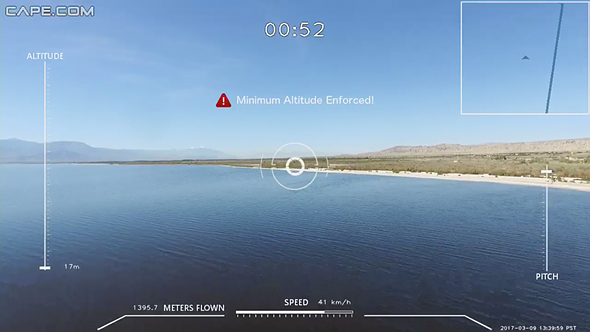 You can’t go beyond the zone’s boundaries, can’t crash your drone into another drone, and can’t stray outside of minimum and maximum altitudes – autopilot will kick in and prevent you from doing any of these things. You quite literally learn the controls on the fly, but they’re easy to master. There’s some lag, but it was honestly less than I expected. In no time, I was zooming across a little patch of California desert at a reasonable speed and legal altitude. There wasn’t much to see, since that’s how deserts are, aside from some distant brush and pixelated mountains on the horizon. And on that topic: considering you’re flying a drone that could very well be a world away, the live feed resolution isn’t bad. At best it looks like a Google Street View image, but most of the time it’s a bit more pixelated than that as it catches up with your movements. This translates to a slightly less awe-inspiring experience than, say, actually being there to gaze on some distant desert mountains. I’m trying to drown this drone and it’s having none of it. The zones feel small once you’ve flown from one edge to the other, and by necessity the controls are pared down to a minimum. If it’s a truly realistic piloting experience you’re hankering, I’m not sure it’ll scratch that itch. Playing tennis on a Nintendo Wii is convenient and fun in its own way, but it’s not the same experience as playing on a real court with a racquet in your hand. You don’t come away with the same satisfaction when so much is done for you. So if it doesn’t quite provide the same excitement as flying a drone in person, is it escapism that Cape can provide? Sure, getting a peek at the sun for the first time in days, even virtually, felt pretty nice. I can attest to how strong the desire is around Seattle to be somewhere sunny right now. I got a little bit of that escapism from Cape, but not so much that I’ll be racing back to fly somewhere else tomorrow. But really, when you think about what Cape allows you to do, it’s kind of incredible. You’re controlling an aircraft hundreds, maybe thousands of miles away, in real time. Finding visually rich places where those drones can be operated safely and legally seems like a tricky balance. Cape’s website says the company is working on ‘unlocking new locations,’ and if one of those locations is in say, Norway or Iceland, then you’d definitely have my attention. It’s not jetpacks, but maybe we’re getting closer.